The feature-packed, super-popular portable piano The Roland FP-30 is the portable piano you’ll want with you in every musical scenario. From stage and studio to music class and family home, this flexible, feature-packed instrument has already been chosen by 150,000 discerning players – and counting. From a hobbyist’s home instrument to a professional’s play-anywhere second piano, this model ticks all the boxes, offering Roland’s acclaimed sound, feel and modern features in an on-the-move 88-note format. 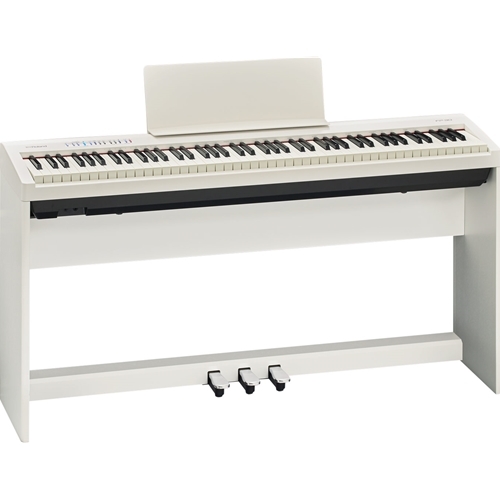 Available in white or black, the Roland FP-30’s sleek, elegant styling is a welcome addition to any room. Adding in numerous sounds beyond the piano, built-in practice and recording functions, and Bluetooth® wireless support for working with popular music apps, the FP-30 delivers a premium musical experience previously unattainable in such a streamlined package. *The Bluetooth feature may not be available, depending on the country where the product is purchased. Superior Sound and Touch That Satisfies the Most Experienced Pianists The FP-30’s exceptional performance easily outshines other instruments in its class. Roland’s unrivaled sound and feel deliver an authentic piano experience for maximum expression, providing a solid foundation for proper learning and the detailed articulation and response that experienced players demand. Supporting the FP-30’s advanced SuperNATURAL Piano engine is a powerful onboard sound system, along with a newly developed keyboard that inherits the touch, escapement, and Ivory Feel keys found in our high-end home pianos. Powerful Digital Advantages for Learning, Creativity, and Enjoyment Thanks to its modern digital engine, the FP-30 goes far beyond any acoustic piano, bringing more fun and productivity to your playing sessions. Non-piano sounds like organs, strings, and voices let you enjoy all types of music styles, and a variety of drum patterns are on board to back you up. It’s even possible to layer two sounds together or play different sounds with each hand. Bluetooth wireless is built in for working with MIDI music apps on mobile devices, while USB support enables you to play along with favorite tunes and save SMF songs captured with the FP-30’s recorder. Twin Piano mode is perfect for private lessons, allowing student and teacher to play side by side in the same octave ranges. And by plugging in headphones, you can get lost in musical journeys day or night without disturbing housemates or neighbors. Highly Portable for Life on the Move Available in white or black, the FP-30 offers a sleek, elegant look that’s a welcome addition to any room. The light, compact design fits in tight living spaces and is easy to move when needed. It’s great beyond the home as well, giving performers and music educators a pro-level instrument that’s incredibly mobile. For a more traditional setup, the optional KSC-70 stand and KPD-70 three-pedal unit provide an integrated look and classic pedal configuration while maintaining a much smaller footprint than a typical upright piano. Another great benefit is that the KPD-70’s foot pedals can be used for hands-free turning of onscreen music pages while using mobile apps such as piaScore and Sheet Music Direct.